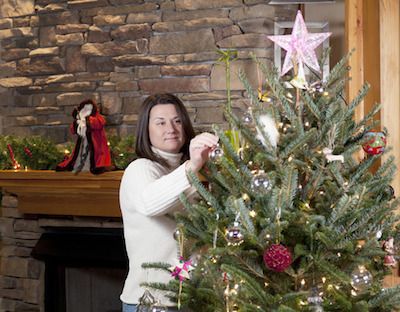 Having a live Christmas tree during the holidays can fill your home with a wonderful aroma. It can also leave you with a mess to clean long after it’s gone. Pine needles, sap, even stains on your hardwood floors can easily leave you questioning if its worth it. Sweeping away pine needles may seem to be an easy task, while removing tree sap stains can prove to be difficult. Your first line of defense is preventing the stain altogether, but even tree skirts and coverings underneath the tree can allow stains to penetrate through. Whether you have real wood floors or laminate, try some of these methods for removing Christmas tree stains from your flooring. Alcohol – try using a clear alcohol such as Vodka to absorb the stain. Pour directly onto the stain to cover completely. Allow to sit, then absorb with paper towels. Ice – rub the stain with ice to freeze tree sap. Once frozen, gently scrape away with a spatula. Rubbing alcohol – pour the alcohol onto a rag, rub into the stain and allow to sit. For sap, gently scrape off residue. Then buff away. Citrus solvents – choose a citrus based solvent like Goo-Gone. Gently rub a generous amount onto the stain, allow it time to break down adhesives, and then wipe away. Lubricant – spray a lubricant like WD-40 onto the stain and then wipe away. Continue the process until the stain disappears. Exercise caution when using both alcohol and petroleum based products as both are flammable. Be sure to test in an inconspicuous area of your hardwood flooring, as some products can strip the finish and discolor your flooring. Check with a professional if you have further questions. Why Choose Our Team for Hardwood Floors?